After a break of nearly two years, the leaders of two of the world's most powerful countries finally met on July 7. With much anticipation, Russian President Vladimir Putin and U.S. President Donald Trump held their first face-to-face session, on the sidelines of the G-20 summit in Hamburg, Germany. The hype surrounding the meeting was similar to that generated by theReagan-Gorbachev summits of the 1980s, when U.S.-Russian relations were at a similarly low level. The Russians were cautious going into this meeting and let the White House define the type of encounter, knowing full well the pressure on Trump from Washington for his first meeting with Putin. Once a formal bilateral meeting was scheduled, the Kremlin set a fairly low bar on expectations. Kremlin spokesman Dmitry Peskov said that the goal of the brief encounter was to simply re-establish a dialogue, because Russia has not held a formal bilateral meeting with a U.S. leader in two years. The United States was cautious as well, debating public perceptions of the encounter while holding the contents of any agenda close. There was no shortage of topics to discuss: conflict in eastern Ukraine and Syria, North Korea's latest missile launch, counterterrorism and the reach of Russia's hybrid warfare strategy into the United States. I write from the salubrious climes of Mhow, near Indore, on the Malwa plateau. I am here ironically to lead a seminar on Hybrid Warfare, one of my favourite subjects and an area yet not sufficiently studied by the Army. Switching on television only at 10pm on 10 July after I found missed calls galore from television channels, I knew there was something major which had occurred. The back of my mind had a niggling premonition too; one lives with these negative premonitions if you have been deployed in such conflict zones for long. Regretfully the premonition was true; it was the Yatra which was under attack. I responded to requests of the channels because I felt I had the necessary experience to send the right messages, having seen eight Yatras and organised four of them. Condemnation in outright terms was the start point. It had to be. In the world of connectivity that we live in, the voice of condemnation must come from those who will make a perceptional difference. The next message in a three-minute mobile phone interaction with a channel which was necessary was the importance of not allowing the adversaries any element of success. That meant stating unequivocally that the Yatra must not stop; it needed to continue without a break, right from the next morning. The Yatra is not just a pilgrimage – it's a national event. Even if people may not have visited the holy cave the emotional connect to Lord Shiva and the holy cave is very high. The last message needed was to convey that expectation of hundred percent security may not be realistic. Somewhere, someone will make a mistake in the thousands of security men deployed for protecting the Yatra. That mistake will always be costly. It does not mean we do not aspire for hundred percent security and pin point responsibility for a costly lapse. NEW DELHI — The navies of India, Japan and the United States began a set of war games on Monday with a particular target: submarines capable of sliding unannounced into the deep waters of the Indian Ocean, silently taking positions near the Indian coastline. It is not a mystery whose submarines are at issue. Last month, the Indian Navy announced a plan to permanently station warships to monitor movement through the Strait of Malacca, where many Chinese vessels enter from the South China Sea. And in recent weeks, navy officials here have reported a “surge” of Chinese military vessels entering the Indian Ocean. Routine maritime exercises have long served as a gauge of India’s uneasy relationship with China, prompting a shrug or a blast of condemnation, depending on the circumstances. The annual series of naval exercises, known as the Malabar series, began in 1992. This year’s event was the largest to date, and the first to feature carriers from all three navies. The games are unfolding under tense circumstances, nearly a month into an aggressive standoff between Chinese and Indian border forces in the Himalayas. Indian Prime Minister Narendra Modi’s visit to Israellast week generated a lot of interest in Pakistan for a range of reasons. While the conspiracy theorists touted the trip as the formal confirmation of a “Zionist-Hindu” plot to launch a nuclear attack on Pakistan – and Islam – the more realistic debate centered around the range of arms deals signed between the two countries. These deals include the purchase of 8,000 Spike anti-tank missiles from Israel’s Rafael Advanced Defense Systems, which was finalized in 2014. This is in addition to the Barak 8 air defense systems that India would purchase from Israel Aerospace Industries, for use on both land and water. Last month, an Indian naval contingent headed by the navy chief participated in a five-day drill in Israel. Three months from now Indian pilots will be in Israel for the Blue Flag air force training exercise. And if all agreements go ahead as planned, 2017 would be a record year for Israel’s arms sales to India – the world’s largest weapons importer in recent years. India can’t afford to keep sleepwalking between China and the United States. In light of the recent border skirmishes between India and China, Indian media and political commentators have spent much time debating India’s proper response in a narrow military sense. However, there has been very little discussion with respect to the larger geopolitical question facing India, of which the recent skirmishes are only minor yet dangerous incarnation. Not since the 1950s has Indian foreign policy encountered such a critical crossroads, and for now the country is sleepwalking its way forward, with no clear vision or strategy. In the 1950s, the Cold War was gathering steam and countries faced immense pressures to align with either the Soviets or the Americans. This choice determined their destinies for the next four decades and the after-effects still persist. India chose to be non-aligned, though eventually growing close with the Soviet Union. This choice had profound implications. While it allowed India to punch above its weight by giving it a global stature, it also provided space for Pakistan to forge a close relationship with the United States, which continues to be a thorn in the India-U.S. relationship. India had to slowly rebuild its relationship with the United States after the dissolution of the Soviet Union orphaned a dependent poor state. One could even argue that India’s domestic liberalization program was delayed by a couple of decades owing to Soviet influence. Choices have consequences. Nearly 16 years after the international intervention toppled the Taliban government, war rages in Afghanistan. A gradual but steady deterioration in security — including the massive sewage truck bomb that recently killed 150 civilians in Kabul recently — has leaders inside and outside Afghanistan once again searching for a new strategy. The Afghan government has announced fresh elections in 2018 and President Ghani has renewed calls for a comprehensive peace process that involves cooperation from Afghanistan’s neighbors. Meanwhile, President Trump is poised to roll out a new Afghanistan plan, which began with Secretary of Defense James Mattis telling the Senate that he will add up to 5,000 U.S. troops to the 8,500 already there. The addition of U.S. troops to support and mentor the Afghan security forces may be a critical element of a possible plan to strengthen the government’s position and forestall collapse or loss of significant territory to the Taliban, ISIS or both. But it will not “win” the war. Despite Pakistani claims to have taken action against all terrorist groups on its soil, U.S. government officials have continued to signal that neither anti-Afghan Taliban groups like the Haqqani Network or anti-Indian groups like Lashkar-e-Taiba (LeT) have been specifically targeted in any of the Pakistani military's security operations. To the contrary, media reports suggest that Haqqani members have been warned of impending operations beforehand. Top LeT leaders still speak before large gatherings in Pakistan’s major cities. The Obama Administration was unable to certify to Congress that Pakistan had taken steps against the Haqqanis, and U.S. President Donald Trump’s joint statement with Indian Prime Minister Narendra Modi last week reflects Washington’s continuing dissatisfaction with Pakistan on the problem of cross-border terrorism. Pakistan’s inadequate action against the Haqqani network and other groups is routinely portrayed by its own leadership as a matter of prioritizing threats. Naturally, they explain, Pakistan is itself a victim of terrorism and is devoting its greatest resources to fighting anti-state groups at home like the Tehreek-e-Taliban Pakistan (TTP). In time, they claim, Pakistan will tackle other groups that threaten their neighbors. Years ago, these claims were somewhat more convincing than they are today. The notion that Pakistan had to first get its own house in order before taking on more ambitious agendas was at least logical, if not terribly satisfying. But over time, U.S. officials have lost patience. They continue to see evidence of official Pakistani collusion with these groups without countervailing indications of any real crackdown. On Sunday John McCain, a longtime U.S. Senator from Arizona who heads the Senate’s Armed Services Committee and onetime Republican Party presidential candidate, appeared on the popular Face the Nationnews program. The last question host John Dickerson asked McCain was about Afghanistan. McCain, along with Senator Elizabeth Warren, a Democrat from Massachusetts, and Lindsey Graham, a South Carolinian Republican, made a visit to U.S. troops in Afghanistan over the 4th of July holiday. Back in Washington, McCain has been at the forefront of congressional criticism of the White House, especially when it comes to Afghanistan. Asked by Dickerson on Sunday for his “sense of the picture there,” McCain was unwavering. “We have no strategy. And we are losing. When you’re not winning, you’re losing,” he said. McCain then cited “unacceptable losses” being borne by the Afghan National Army. Myanmar’s latest peace conference, held on 24-29 May 2017, made welcome progress. Following a deal brokered by China on the eve of the meeting, more armed groups came to Naypyitaw than expected. On the final day, they agreed on 37 “principles” for a future peace accord, including a key provision that the state will be a federal democracy. Yet despite these steps forward, fundamental questions remain regarding where the peace process is heading and how many armed groups are ready to participate. Without new momentum and broader participation, a negotiated end to the conflict will remain elusive. Until just days before the conference, the dynamics appeared much bleaker. The event had been delayed by three months as the government struggled to convince more armed groups to sign the Nationwide Ceasefire Agreement (NCA). Only a few of the planned subnational preparatory dialogues had been held, and others – involving the Shan and Rakhine armed groups – had been blocked by the authorities, adding to frustration. In a further setback, in April the powerful United Wa State Party (UWSP) convened a summit of seven north-east-based armed groups. They issued a statement rejecting the current National Ceasefire Agreement text – an accord signed in 2015 by eight armed groups and the government that paved the way for political talks – and announcing a new alliance, the Federal Political Negotiation and Consultative Committee (FPNCC, “Wa alliance”). A deadlock appeared inevitable since the government and military continued to insist that only by signing the existing ceasefire agreement could armed groups join the peace process. Chinese President Xi Jinping has charged the PLA Air Force (PLAAF) with transforming itself into a “powerful people’s air force with integrated air and space and offensive and defensive capabilities” (iFeng, September 1, 2016). This undertaking aligns with the capabilities prioritized in China’s 2015 defense white paper, China’s Military Strategy, and one that PLAAF Commander Ma Xiaotian has suggested his service must approach with a sense of urgency (Defense White Paper, May 29, 2015; iFeng, September 1, 2016). One important part of this transformation is strengthening the PLAAF’s strategic deterrence and long-range strike capabilities. Xi has expressed personal interest in China’s bombers. 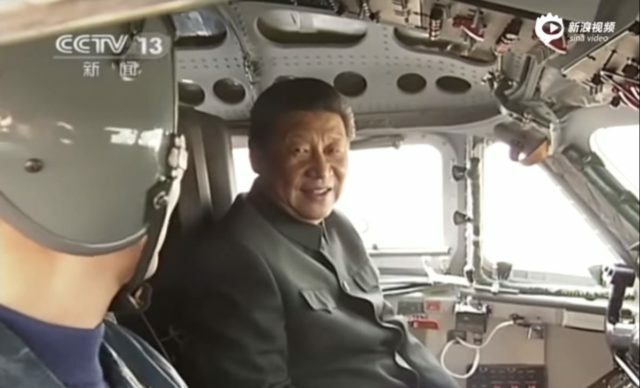 In February 2015 Xi and other members of the Central Military Commission visited a PLAAF bomber base near Xi’an to inspect China’s newest bomber variant, the H-6K (Xinwen Lianbao, February 17, 2015). China appears to have even more ambitious plans for its future strategic bomber force. In 2003, China's Central Military Commission approved the concept of 'Three Warfares', namely: (1) the coordinated use of strategic psychological operations; (2) overt and covert media manipulation; and (3) legal warfare designed to manipulate strategies, defence policies, and perceptions of target audiences abroad. In recent months, Beijing has been intensifying the implementation of this military doctrine. It can be seen every day in the declarations of the Chinese spokespersons: even when on the wrong foot, China makes it sound that the other party is at fault ...by making more noise. In this ‘Warfare’, there is no such a thing as ‘contradiction’. Take an example, a couple of days ago, the Chinese embassy in New Delhi asked Chinese people in India to ‘strengthen self-protection’. The Global Times commented on the “travel notice released amid a fermenting military standoff on the border;” it was referring to the standoff on the Sikkim-Tibet-Bhutan border. According to the Chinese tabloid the advisory notice had to be issued because India trespassed on China’s territory. After completing my first book on Tibet in the 1990s, I looked for a title which could resume the content of my research. At the end of the 19th century, Tibet was a mere pawn in the Great Game between Imperial Powers. The 1890 Treaty on Sikkim, today quoted ad nauseam by the Chinese government, was one of the ‘unequal treaties’ imposed on a smaller nation. Big insects had little consideration for the weak. The story seems to continue today with China building a road on Bhutanese territory without informing Thimphu. But this time, what Beijing had not expected is that India would come to the rescue and defend the small Kingdom. China, which dreams of becoming a ‘big insect’ (without the name!) tried to change the status quo in the Doklam area of the Bhutan-Tibet border. Chinese strategy in the South China Sea is expansionary in aim, incremental by design and realist in orientation. Earlier this year, Kyodo News published a tantalizing summary of a Chinese article that seemed to offer rare insights into Beijing’s intentions in the South China Sea. Unfortunately, Kyodo’s report was too vague to be fully appreciated, or long-remembered. We have tracked down the original. It is well worth a closer look. 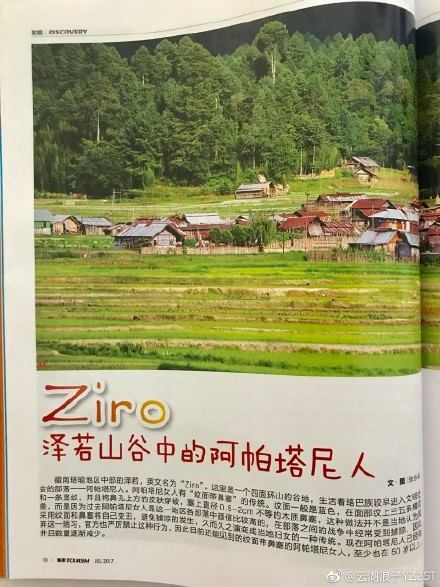 The article comes from a special class of periodical published by the Chinese military for “internal distribution.” These are not classified documents per se. Rather, they are teaching materials and scholarly works written for a select audience. Due to this restricted access, these works are both candid and extremely authoritative. As such, they offer invaluable insights into the thinking of the Chinese military and party-state. This particular article was printed in a mid-2016 issue of Naval Studies (海军军事学术), one of the most important “internal distribution” periodicals on maritime affairs in China. Run by the People’s Liberation Army (PLA) Naval Research Institute, it is a bimonthly scholarly journal that delves into a range of topics on naval strategy. Recent events on the Doklam plateau near the tri-junction of India, Bhutan, and China have resulted in plenty of discussion among Indian analysts. The better among these have pointed out Doklam’s limited tactical value to China and the latter’s clear contravention of prior agreements to preserve the territorial status quo with Bhutan. Why then have PLA troops and their political masters risked a potential conflict on such weak grounds? As Ajai Shukla notes, “Beijing’s wish to extend the Chumbi Valley southwards is incomprehensible.” Understanding how this episode fits with China’s rise and broader strategy in Asia can shed light on this question, as well as on the most effective Indian response. Limited data in the public domain show that the number of Chinese troop incursions along the Line of Actual Control (LAC) with India has been increasing, from 228 in 2010 to 411 in 2013 (and 334 by August 2014). 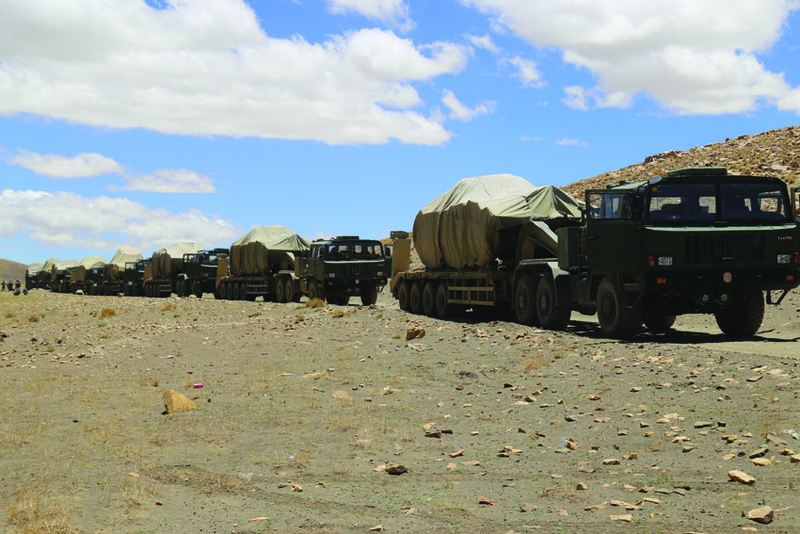 Major episodes in the last four years include incursions in Ladakh at Depsang, Burtse, Chumar, and Pangong Lake. This pattern fits with China’s increased assertiveness in Asia since the late 2000s. The Doklam puzzle is tied to the larger question of why Beijing has abandoned its “peaceful rise” approach and adopted a strategy that is likely to alienate neighbors and invite balancing coalitions such as the growing India-Japan partnership. It is important to grasp the historical facts to understand the India-Bhutan-China tri-junction dispute. The Anglo-Chinese convention of 1890 says that Sikkim-Tibet boundary “line commences at Mount Gipmochi on the Bhutan frontier”. In 1959, at least two letters from Indian Prime Minister Jawaharlal Nehru to Chinese premier Zhou Enlai refer to this convention as the final word on the Sikkim-Tibet boundary. This would suggest that India was on board with Mount Gipmochi—the tri-junction point according to China—being the tri-junction point in 1959. In 2012, New Delhi and Beijing had come to a separate agreement that any tri-junction involving a third country would be settled by involving the third country in consideration. And since Bhutan was not party to the 1890 convention, the Sikkim-Tibet-Bhutan tri-junction remains unsettled. Separately, Beijing and Thimphu arrived at two separate agreements in 1988 and 1998, according to which both sides have agreed to maintain the status quo that existed prior to March 1959. 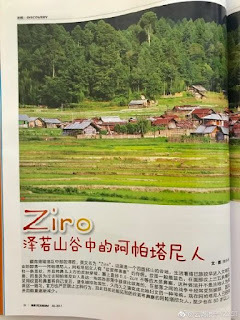 Then, clearly, China’s insistence on building roads in Doka La—between Mount Gipmochi in the south and Batang La, the tri-junction point according to India and Bhutan, in the north—is a violation of three separate agreements it had previously entered into. On July 6, Singapore and Germany signed a joint declaration on strengthening cybersecurity cooperation. The move highlighted the city-state’s efforts to strengthen ties with like-minded states in the cyber domain as they confront growing challenges there. As I have noted before, Singapore has been paying keen attention to the cyber domain as a developed, highly-networked country which relies on its reputation for security and stability to serve as a hub for businesses and attract talent. Cognizant of the growing challenges in the cyber realm – made apparent by attacks on the city-state, including the hacking of the defense ministry’s Internet-connected system in February – Singapore has taken several measures to counter the threat, from the setting up of a new Cyber Security Agency (CSA) in 2015 to the mulling of new laws (See: “Singapore Eyes Tougher Cyber Laws”). One of the CSA’s main lines of effort is in building partnerships with other countries that Singapore can work with in this area. And it has begun doing so, with six memorandums of understanding (MOUs) already being inked with France, India, the Netherlands, the United Kingdom, the United States, and most recently Australia as I have written about previously (See: “What’s in the New Australia-Singapore Cyber Pact?”). KIEV, Ukraine (AP) — NATO’s secretary-general says the 29-member alliance is supplying hardware to the Ukrainian government to help protect its government networks from cyberattacks. Ukraine has recently been hit by a series of powerful cyberattacks, including a June 27 attack that crippled computers across the country. Kiev blames Russia for the intrusions, charges the Kremlin denies. Stoltenberg added that the alliance is studying the Ukraine attacks closely. “NATO is learning a lot from Ukraine,” he said. WASHINGTON — President Trump’s advisers recruited two businessmen who profited from military contracting to devise alternatives to the Pentagon’s plan to send thousands of additional troops to Afghanistan, reflecting the Trump administration’s struggle to define its strategy for dealing with a war now 16 years old. In the last one month, things have begun to turn in the sovereign bond market. The Federal Reserve (Fed) raised the federal funds rate (FF rate) in June to a maximum of 1.25%. Not only that, the minutes of the meeting of the Federal Reserve open market committee (FOMC) have confirmed that the Fed stands ready to start shrinking its balance sheet in the next few months. Some commentators have called the policy stance of the Fed wrong (see, for example, Martin Sandbu of the Financial Times). They feel that the move to raise the policy rate in baby steps risks an end to the economic expansion that is eight years old. They are making the same mistake that they made before 2008. Even if the inflation rate were below 2.0%, and stayed that way, the FF rate in real terms is negative. Or, even if the inflation rate were to edge down to 1.5%, the real FF rate would be barely positive. Hence, the monetary policy is still very accommodative especially since the unemployment rate is below 5.0%, supply of leveraged loans is at a record high, stock indices are at record high valuations and stock market volatility at record lows. This review will establish U.S. nuclear policy and strategy for the near future and shape some of the most important military modernization programs: the new nuclear triad. These new programs, the Columbia Class ballistic missile submarine, the Ground Based Strategic Deterrent ballistic missile, and the B-21 Raider strategic bomber and Long Range Stand-Off cruise missile compose the three legs of this new triad. In this first of two features, The Cipher Brief will examine the Columbia submarine and Ground Based Strategic Deterrent. The nuclear triad emerged as a strategic concept during the Cold War as the surest means of deterring another nuclear power from attacking the United States. ICBMs act as the first-response weapon; ballistic missile submarines act as an undetectable, and therefore survivable, second strike; and strategic bombers offer the flexibility of first or second strike but can be most easily recalled. Each component complicates an adversary’s decision to attack. In theory, an adversary will not strike unless it can overcome each of the three components of the triad and the expense and low likelihood of success deters it from attacking first. The Chinese People’s Liberation Army (PLA) anticipates that future warfare will be “unmanned, invisible, and silent” (“无人、无形、无声”战争), with ever higher degrees of “intelligentization” (智能化). PLA strategists expect that future, autonomous combat involving unmanned systems, as well as the joint operations of unmanned and manned systems, will have a dramatic impact on traditional operational models (PLA Daily, January 5, 2016). 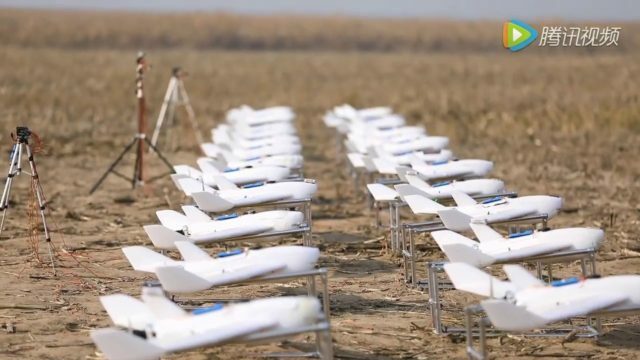 Future UAV swarming (无人机集群) will involve “intelligentized” and semi- or fully autonomous systems. The PLA recognizes the disruptive potential of these techniques, which could be used for saturation assaults (饱和攻击) to overwhelm the defenses of high-value targets, including perhaps U.S. fighter jets or aircraft carriers (Science and Technology Daily, March 29; China News Network, November 2, 2016; China Military Online, December 31, 2016). Chinese advances in artificial intelligence, including deep learning techniques, have enabled considerable progress in swarm intelligence. There is technical and conceptual research, development, and testing ongoing across Chinese academic institutions, the private sector, defense industry, and military research institutes to support such capabilities. At this point, given the limited information available and the relative opacity of these efforts, it is difficult to compare U.S. and Chinese advances in swarm intelligence. Nonetheless, the PLA has closely tracked U.S. initiatives focused on swarm tactics (e.g., Science and Technology Daily, March 29; Science and Technology Daily, May 30, 2016) and seeks to develop countermeasures and comparable capabilities. Looking forward, the PLA’s advances in intelligent unmanned systems and swarm tactics could serve as a force multiplier for its future military capabilities. Germany is renowned for much, but she has rarely been seen as a traditional seapower — least of all by herself. Lutz Feldt, retired former Chief of the German Navy, often lamented “German seablindness.” Nevertheless, the sturdy — if little known — German maritime community has recently achieved a remarkable distinction: Of all major international naval institutions and prominent maritime research clusters, it was a German one — the Institute for Security Policy of the University of Kiel (ISPK) — that edited last year’s Routledge Handbook of Naval Strategy and Security. The volume is a valuable contribution to, and (perhaps surprisingly to some) a positive indication of, the quality of contemporary maritime strategic thought in Germany. Although the ISPK’s director, Joachim Krause, and the head of its maritime strategy and security department, Sebastian Bruns, drew on a wide network of international experts, the fact that a German institution would be entrusted with and capable of assembling this kind of cross-cultural expertise is remarkable. It’s also not an intuitive choice, given that Germany has been very reluctant over the past decades to engage in strategic — let alone maritime strategic — debate. Seen this way, the Kiel-based institute’s editorship of the Routledge handbook could indicate a growing maritime and strategic awareness in Germany, spurred by European integration but somewhat hobbled by a prevailing reluctance to acknowledge the persisting role of hard power in international affairs. The battle damage was devastating and constituted the leading edge of what the United States soon would discover was a widespread, strategic attack. The guided-missile destroyer had not “seen” the incoming swarm because it had not recognized that its systems were under cyber attack before things turned kinetic. 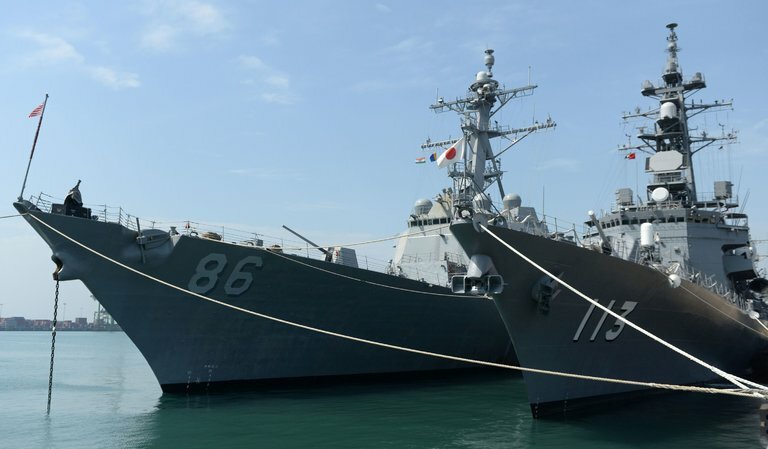 The undetected cyber activity not only compromised the destroyer’s sensors, but also “locked-out” its defensive systems, leaving the ship almost helpless. The kinetic strikes came in waves as a complex swarm. The attack appeared to be conducted by a cloud of autonomous systems that seemed to move together with a purpose, reacting to each other and to the ship. The speed of the attack quickly overwhelmed nearly all the ship’s combat systems, and while the information technology specialists were able to release some defensive systems from the clutches of the cyber intrusion, the sailors in the combat information center (CIC) simply were unable to generate the speed to react. Decision-action times were in seconds or less. Indeed, it appeared from the now very limited situational awareness in the CIC that some of the enemy autonomous weapons were providing support to other systems to set up attacks of other systems. The entire event was over in minutes. Some of the best book discoveries are serendipitous. Years ago, I was a young officer, hungry for anecdotes, for stories—anything that described how military leaders used their reading to guide them in their profession. While stationed in Europe, on a whim, I read a copy of Roger H. Nye’s splendid little book Challenge of Command. Looking for more books by Nye, I eventually discovered his lesser known but seminal work The Patton Mind: The Professional Development of an Extraordinary Leader. I had hit the jackpot. The Patton Mind was the most comprehensive and detailed account of a military officer’s professional reading I had ever encountered. Nye, because he was a history professor at West Point, had access to many of Patton’s books and journals which were stored (and still are) at the academy’s library. And with boxes of Patton’s archives, Nye was able to detail the general’s reading life. For instance, we learn that in 1910, during Patton’s honeymoon in London, that he picked up a copy of Colonel David Henderson’s The Art of Reconnaissance. There, Patton also bought a 1909 copy of Clausewitz’s On War. After the couple returned from London, Patton packed his copy of On War along with some other books he had bought while overseas and took them with him on Army maneuvers in Wisconsin. When he finished On War, he signed and dated it, “Finished August 15 1910/George S. Patton, Jr,” and then told his wife Beatrice: “Clausewitz is about as hard reading as anything can well be and is as full of notes of equal abstruseness as a dog is of fleas.” Many a war college student has uttered similar words. ARLINGTON, VA (June 21, 2017) – The real-time sharing of cyber threat data between government and key financial institutions would enhance the U.S. financial sector’s cybersecurity posture, according to a new position paper by the Intelligence and National Security Alliance (INSA). 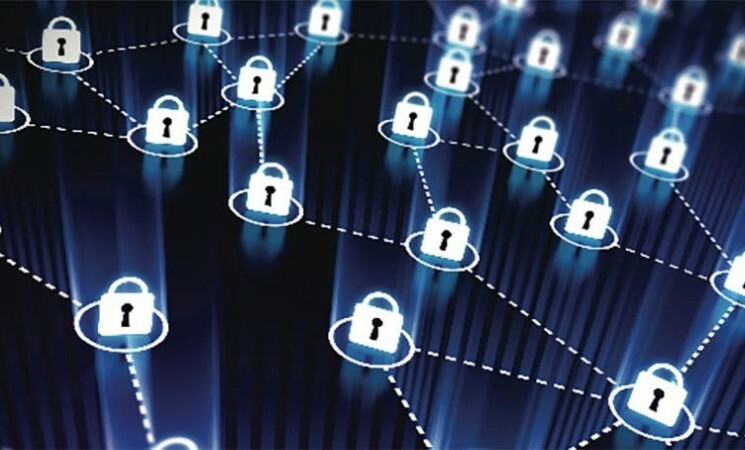 The report, prepared by INSA’s Financial Threats Task Force, proposes the establishment of a program for classified information sharing modeled on the Defense Industrial Base (DIB) Cybersecurity (CS) program, colloquially known as DIBnet. The white paper, FINnet: A Proposal to Enhance the Financial Sector’s Participation in Classified Cyber Threat Information Sharing, includes four recommendations for initial implementation and development. “In our deliberations, the Task Force stressed the importance of establishing a system that strengthens public-private trust and enables government and industry to respond to financial threats in real time. This proposal is a crucial step toward protecting critical financial infrastructure against a sophisticated and rapidly evolving array of cyber threats,” said Rob Knake, one of the paper’s primary authors and the Whitney Shepardson senior fellow at the Council on Foreign Relations. Reports of intrusions into industrial control systems (ICS) broke late last week – this time in several U.S. power plants, including the Wolf Creek nuclear facility in Kansas. The alleged perpetrator? Russia, leading many to compare these incidents to the successful and damaging Russian attacks against the electrical grid in Ukraine. So how concerned should we be? These intrusions are not necessarily new - but they are worrisome. Repeated cyber intrusions have targeted U.S. ICS – the technology that keeps utility operations running. In 2014, DHS warned about the presence of Black Energy, a piece of malware, in U.S. systems – the same malware that caused disruption to electric power in the Ukraine. At that time, Black Energy was believed connected to the Sandworm Gang, an alleged Russian surrogate. DHS and the FBI apparently sought to use this as yet another lesson for the industry. The hackers allegedly used phishing emails, such as fake resumes, sent to plant engineers and containing malicious code. This is obviously not a new technique and once again points to the human element as the greatest cyber vulnerability. According to DHS officials, operational systems were not implicated and intrusions were limited to administrative networks. The intruders wanted to map out and/or analyze these control systems. We’ve seen adversaries hunting for intelligence in this manner before. Any cyber intelligence service worth its salt is in the business of discovering their adversary’s vulnerabilities and information with which it can improve the efficacy of its malware. Rep. Elise Stefanik, R-N.Y., left, is the chair of the House Armed Services Emerging Threats and Capabilities Subcommittee, with jurisdiction over Pentagon cyber operations, counter-terrorism, weapons of mass destruction and U.S. Special Operations Command. U.S. Rep. Elise Stefanik, R-N.Y., is the chairwoman of the House Armed Services Emerging Threats and Capabilities Subcommittee, which has jurisdiction over Pentagon cyber operations, counter-terrorism, U.S. Special Operations Command and countering weapons of mass destruction. But because it oversees Pentagon science and technology programs, it is “the subcommittee about the future,” said House Armed Services Committee Chairman Mac Thornberry, R-Texas. Fitting then that Thornberry picked Stefanik — the youngest woman ever elected to Congress, at age 30 in 2014 — to lead it. A newcomer to political office, Stefanik, a Harvard graduate, worked in President George W. Bush’s White House and managed debate preparation for House Speaker Paul Ryan’s run for vice president in 2012. Thornberry, who chaired the ETC subcommittee for four years, praised Stefanik as the studious, hands-on lawmaker needed to provide continuity to House oversight of complicated cyber policy issues. To modernize the “Five Eyes” arrangement, the five governments must develop a common strategy for gathering information on today’s threats, which stem from non-state actors like terrorist groups, hackers and transnational criminal syndicates — as well as from nation-state adversaries. 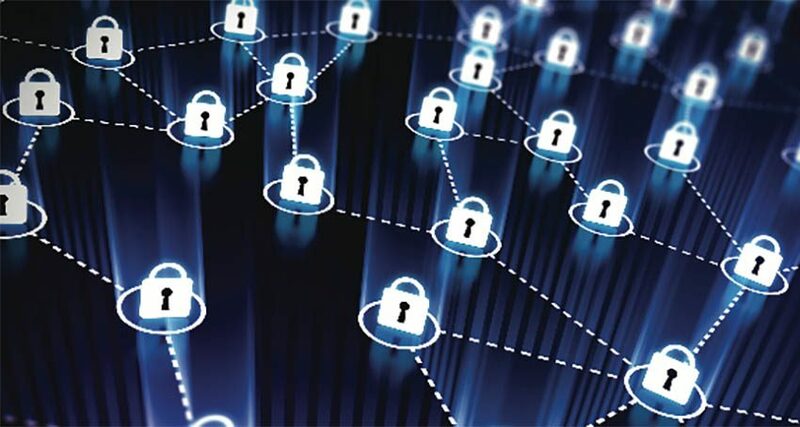 However, to be successful, they must speed the dissemination of information to enable real-time responses, counter disabling cyber threats like the recent “Wanna Cry” ransomware attack and overcome adversaries’ use of encryption. Furthermore, to maintain public support for robust intelligence collection in democratic political systems, each of the Five Eyes governments must strengthen and clarify the legal frameworks that govern intelligence activities and address growing privacy concerns among the citizenry of all five nations. Under the Five Eyes arrangement, the five Anglophone countries have shared intelligence and collaborated on intelligence collection and analysis for 70 years. But the partnership — which originally focused on the Soviet Union and the Warsaw Pact — has been slow to adapt to rapidly evolving 21st century threats. Since 2013, Five Eyes ministerials have addressed religious radicalization, cybersecurity, and other common threats. Senior executives need to understand the tactical as well as strategic opportunities, redesign their organizations, and commit to helping shape the debate about the future of work. We are on the cusp of a new age of automation. Robots have long been familiar on the factory floor, and software routinely outperforms humans when used by delivery companies to optimize routes or by banks to process transactions. But rapid strides being made in artificial intelligence (AI) and robotics mean machines are now encroaching on activities previously assumed to require human judgment and experience. For instance, researchers at Oxford University, collaborating with Google’s DeepMind division, created a deep-learning system that can read lips more accurately than human lip readers—by training it, using BBC closed-captioned news video. Similarly, robot “skin” is able to “feel” textures and find objects by touch, and robots are becoming more adept at physical tasks (such as tying a shoelace) that require fine motor skills. There are still limitations. Machines lack common sense, can’t always pick up on social and emotional cues, and still struggle to understand and generate natural language. Yet the pace of technological progress, propelled by massive increases in computing power and cloud storage, suggests the next frontier will soon be crossed. While lots of attention is directed toward identifying the next great start-up, the defining tech-industry story of the last decade has been the rise of Apple and Google. In terms of wealth creation, there is no comparison. Eight years ago, neither one of them was even in the top 10 most valuable companies in the world, and their combined market value was less than $300 billion. Now, Apple and Alphabet (Google’s parent company) have become the two most valuable companies, with a combined market capitalization of over $1.3 trillion. And increasingly, these two behemoths are starting to collide in various markets, from smartphones to home-audio devices to, according to speculation, automobiles. But the greatest collision between Apple and Google is little noticed. The companies have taken completely different approaches to their shareholders and to the future, one willing to accede to the demands of investors and the other keeping power in the hands of founders and executives. These rival approaches are about something much bigger than just two of the most important companies in the world; they embody two alternative models of capitalism, and the one that wins out will shape the future of the economy.